There are a lot of places Eagles quarterback A.J. Feeley would rather be this week than the film room. Once the projector rolls it’s just a matter of time before No. 51 flashes across the screen and back into his life – again and again and again. 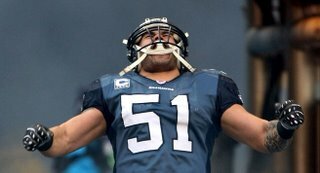 Seattle Seahawks middle linebacker Lofa Tatupu intercepted Feeley three times last December, completing the trifecta at his four-yard line with 23 seconds left to preserve a 28-24 triumph over the Eagles at Lincoln Financial Field. If Feeley had it to do over – and in his head, he’s done so too many times to remember – there is no doubt what he would do. “Tuck it and run,” he said. That valuable bit of information is safely stowed with Eagles starting quarterback Donovan McNabb, who has been known to lock in on a receiver or two and missed the above game with ankle and thumb injuries. Face it, the best hope the Seahawks (2-5) have of beating the Eagles this Sunday at Qwest Field is forcing the turnovers they did last season. The Seahawks showed signs of returning to their old form last week registering five sacks, a 75-yard interception return for a score and a 50-yard fumble return in a win over the San Francisco 49ers. Anything head coach Mike Holmgren gets from his offense is a bonus as backup quarterback Seneca Wallace likely will start the fourth straight game in place of Matt Hasselbeck, who has back and knee issues, and the Seahawks are a couple of quarts low at the skills positions due to injuries. The way Feeley sees it, for the Eagles to avoid turnovers they must account for Tatupu (6-0, 242), a rangy and explosive defender playing in a scheme that allows him to read the quarterback’s eyes and flow to the ball almost like a safety. Tatupu also is savvy, having used his knowledge of the West Coast offense the Seahawks use to bait Feeley into a couple of picks last year. One of the basic West Coast slants has one receiver clearing an area for another. On that December day at the Linc, Tatupu twice made Feeley think he would cover the tight end before breaking back toward the receiver running the slant. On the game-sealing interception Tatupu bounced back in front of wide receiver Reggie Brown. It's pretty obvious the Eagles must beat the Seahawks (2-5) on the road and the defending Super Bowl champion New York Giants (6-1) the following week to have a legit chance to make the playoffs. A loss to the Seahawks, unlikely as it is would be devastating for it would drop the Birds to 3-4 in the conference. A loss to the Giants would be most crippling because it would further bury the Birds in both the conference and divisional playoff tiebreakers. The Birds are 0-2 in the East. By the way, the Eagles-Falcons game did a 27.9 rating and a 53 share in the Philadelphia market according to Fox TV. The Phillies numbers for Game 4 of the World Series versus the Rays were through the roof - a series-high 39.0 rating with a 54 share. Nationally Game 4 of the World Series recorded a series-high 9.3/15 household rating/share, with an average audience of 15.5 million viewers. That’s projected to deliver Fox its highest-rated, most watched Sunday night since Super Bowl XLII last February according to figures released by Nielsen Media Research. 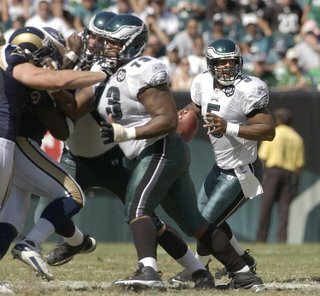 If the Eagles stay in playoff contention you will see Shawn Andrews back in the lineup before the end of the 2008 season. There's every reason to believe the doctors and trainers corrected the problems in his lower back. And every reason, considering the type of the repairs, to believe he at least will stay on target in the best-case scenario of a six-week rehab. That would bring the Pro Bowl talent back in late December or early January - just the shot in the arm a team with age on the edges of the O-line might need. A couple of weeks before the Eagles played the San Francisco 49ers, Shawn Andrews was lining up tickets so friends could watch him play in the game. Teammates confirmed the Pro Bowl guard was encouraged by his rehab from a herniated disc in his lower back. But Andrews recently had a setback according to sources close to the player, leaving him basically with one last option to play this season. Dr. Robert Watkins, an authority on backs, prescribed and performed mircodiscectomy surgery on Andrews Tuesday in Marina Del Rey, Calif. The six weeks-to-three month timetable the Eagles gave for the return of Andrews tells you everything they know about the repairs. Basically, they don’t know. 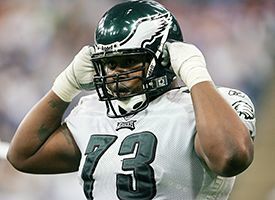 And with the 360-pound Max Jean-Gilles rounding into game shape, the Eagles are prepared to go on although for now Andrews will occupy a roster spot instead of being placed on injured reserve. The Eagles privately haven’t given up on getting more than two games out of Andrews, who has begun a five-week rehab according to his agent, Rich Moran. The surgery was sensitive enough that coast-to-coast air travel temporarily was out of the question. Andrews was unavailable for comment, but he’s OK with the way Burkholder and the Eagles exhausted all treatments trying to get him back on the field before the surgery according to Moran. Had Andrews met with Watkins from the get-go, Moran said of discussions with his client, the doc “would have done it the same way. It can be a little intimidating physically to meet someone as large as Matt Ryan, the 6-4, 220-pound quarterback of the Atlanta Falcons. The man engulfs Joe Plumber. But the product of Penn Charter High and Exton quickly puts you at ease in an almost fatherly way belying his age - 23 years old and counting. When Ryan attended the Philadelphia Sportswriters Association dinner this past spring to collect an award, he made the time to speak to everyone - including this writer soliciting celebrity picks for the Super Bowl. Ryan chose the Patriots, not the Giants, and he would have been right had Pats quarterback Tom Brady (torn ankle ligaments) been right. Explaining the pick, Ryan sounded more like a coach than the guy that would be the third overall selection in the draft. And it's safe to say he's played beyond his years in leading the Falcons to a 4-2 start. 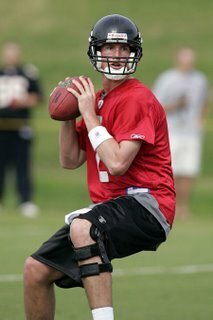 Ryan signed the richest NFL rookie contract ever - a $72 million, six-year pact including $34.75 million guaranteed. It hasn't changed him. The way Ryan has tackled the immense challenge of living up to the deal, it's safe to say that won't change either. The Eagles performed their due diligence chatting with the Chiefs about tight end Tony Gonzalez, who wanted to be traded. But it didn't go much further than that. They had to get involved simply to drive up the asking price for Gonzalez, who was being courted by the Giants. When Gonzalez wasn't dealt tt was a subtle win for the Eagles, who quietly indicated the Chiefs really didn't want to trade the player they won't have to defend in three weeks. This is the way this stuff happens, people. The Giants need a tight end a lot more than the Eagles, who have been unable to find a way to consistently get L.J. Smith and his $4.5 million contract involved in the offense. When the Giants opened the bidding with a sixth-rounder, someone had to up the ante. Eagles auditioning kickers this week? 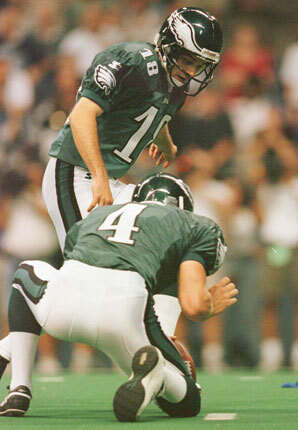 The latest information I have is Eagles kicker David Akers is safe despite his 40-plus yard field goal slump. Hey, Akers kicked three of his four field goals (all less than 40 yards) in the fourth quarter Sunday to help lead the team to a 40-26 win over the Niners. The 54-yarder that was blocked and returned for a TD wasn't his problem. The latest NFL Network speculation of Mike Lombardi (who worked for the Eagles in the mid-1990's) is the Eagles will bring in kickers for a tryout this week. A tryout wouldn't be a shocker; the Birds work out players almost every week. Replacing Akers at this stage of the season would be a huge mistake, though. All the Eagles must do to shake him out of this slump is NOT - repeat, NOT - let him crank one up from 50 or more yards. Forty-nine is OK; 50 is NOT. Case closed until at least next season. The Eagles still cannot convert a third down to save themselves in the second half. After converting just three of 19 third downs in the second halves of three straight games, the Eagles went just 1-for-5 against the 49ers. That breaks down to just one third down conversion in each half of the last three games, and it's not good enough to get the Eagles to the playoffs regardless of how the NFC East landscape has changed with losses by the Cowboys (4-2) and Redskins (4-2) plus the hand injury to Dallas quarterback Tony Romo. Donovan McNabb's most loyal fans - parents Wilma and Sam - grabbed a flight from Chicago-Midway to San Francisco Saturday to back their son in one of the biggest games of his professional career. Sick and tired of losing, Donovan McNabb called a team meeting this past week to clear the air and get all of his teammates on the same page while they're still mathematically alive for a playoff berth. One more loss and the Eagles (2-3) are pretty much toast as the NFC has four teams with winning records outside of the three teams leading divisions. There are just two wild card berths in the conference. McNabb at least can count on a couple of hugs if his teammates let him down. The flight to SFO, by the way, had plenty of Eagles fans, just no one willing to sellout and kick-start the E-A-G-L-E-S, Eagles! chant. The Eagles are going to have to get their rookies under control before it costs them the same type of damaging penalty a veteran picked up on special teams last Sunday. Eagles rookies DeSean Jackson and Quintin Demps have been notified by the NFL they will be fined $10,000 apiece for their celebration in the end zone this past weekend at Lincoln Financial Field, according to sources. Jackson scored on a 68-yard punt return giving the Eagles a 14-0 lead over the Washington Redskins when Demps joined him in the end zone. They posed face-to-face with arms folded and heads bobbing. To the NFL, the act wasn't among the "natural, spontaneous expressions of exuberance and celebratory acts" which typically are not penalized or fined by NFL authorities. Looking at the replays, Jackson and Demps apparently violated the unsportsmanlike conduct rule when "two or more players engage in prolonged, excessive, premeditated or choreographed celebrations, particularly after scoring plays." An Eagles spokesman wasn't aware of the disciplinary action that the league routinely confirms on Fridays. Both rookies said they would appeal the fines. "Yeah, that's crazy," Jackson said. Demps thinks they did nothing excessive enough to warrant a fine. "Definitely I'm appealing," Demps said. "I don't think it (warranted a fine)." Eagles linebacker Torrance "Tank" Daniels also will be billed $5,000 by the NFL for tackling punt returner Antwaan Randle El by the facemask. Daniels also intends to appeal the fine. Daniels was flagged 15 yards for his tackle, and it set up the decisive touchdown for the Redskins. Jackson and Demps were fortunate the Eagles weren't penalized for unsportsmanlike conduct after their demonstration. They listened. It was a captive audience, a players-only meeting Monday. But teammates of quarterback Donovan McNabb listened to his lecture about preparation, and their lack of it the past two weeks, and how that must change if they want to have a real season. Knowing this team, once is not enough; not nearly enough. Deep inside McNabb has to know he's got to send a message of some sort almost daily beginning today. Donovan McNabb wouldn't have mentioned the Redskins on his latest blog entry at yardbarker.com unless he had a healthy fear of the Eagles' weekend foe which is coming off a stunning road win over the Cowboys. 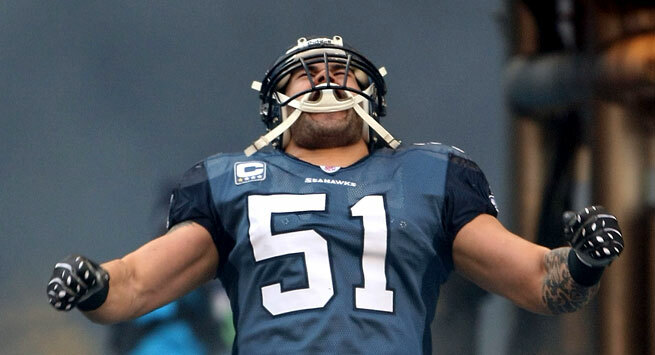 "If we don't start to focus on Washington then we can be in some real trouble," McNabb blogged. "The NFC East is talented from top to bottom. Don't get me wrong, I would never bet against us in anyone of the matchups. But I do recognize that Washington, Dallas and the New York Giants are also very good football teams. When we were winning the NFC East, we did so because we were able to beat those teams. We need to get back to that brand of football." McNabb is absolutely correct. At his news conference Wednesday he called the Skins contest a must-win game. It reads here that if the Eagles don't win this game they need a series of football minor miracles won't make the playoffs.